Reactive oxygen species (ROS) are oxygen-containing molecules that usually harbor unpaired electrons rendering them highly reactive and potentially dangerous oxidants . Major ROS sources in the heart are constituted with superoxide anion (O2.-), hydrogen peroxide (H2O2), and hydroxyl radical (HO ). As highly metabolic cells, cardiomyocytes maintain abundant of mitochondria to support the cellular store of adenosine triphosphate (ATP), which is required for cardiac function . And the mitochondria could supply the major source of endogenous ROS, in which oxygen is converted into superoxide anions, hydroxyl radicals and hydrogen peroxide through the electron transport chain (ETC) . Besides, nicotinamide adenine dinucleotide phosphate (NADPH) oxidases and nitric oxide (NO) synthases are another two critical sources of ROS production . Under physiological conditions, there is a balance between ROS generation and elimination. In view of the critical role in cell signaling, dysregulated generation of ROS usually contributes to the pathogenesis of cardiovascular diseases, including atherosclerosis, heart failure, cardiomyopathy, and cardiac hypertrophy. In recent years, emerging evidence indicated that non-coding RNAs (ncRNAs) play important roles in various biological processes, as well as in disease progression [5-7]. Noncoding RNAs are originally from genome and generally not translated into proteins, and they are currently classified into two subgroups according to their transcript size: short ncRNAs (<30 nucleotides), including miRNAs, piwi-interacting RNAs (piRNAs), and short interfering RNAs (siRNAs); and long ncRNAs longer than 200 nucleotides (lncRNAs) . Most of the non-coding RNAs show tissue specific distribution pattern and thus participate in gene expression regulation. Researches on miRNAs indicated that some miRNAs are perturbed and localized to mitochondria, regulating mitochondrial-mediated cardiac cell survival/death when exposed to ROS stress [9-11]. For instance, mitochondria overproduce ROS during ischemic-reperfusion (I/R), while miRNAs's expression are altered after I/R injury . Increasing evidence suggests that not only miRNAs, but also lncRNAs are related to increased ROS in cardiomyocytes. There are complex interactions between ROS metabolism and ncRNAs levels, and further studies need be provided to reveal the molecular mechanisms of ncRNAs regulating myocardial diseases under ROS-related stress conditions. In this review, we will focus on the ROS-related ncRNAs that alter the mitochondrial homeostasis and involve in the context of the cardiovascular system. Physiological ROS are highly reactive molecules that play a critical role in intracellular signaling as second messengers; however, when ROS production is exacerbated or scavenging insufficient, disorder of many biological processes occurs . Furthermore, the redox imbalance induced by altered ROS generally influences signaling pathways that contribute to cardiomyocytes' apoptosis, ER stress, and autophagy, which ultimately contribute to a wide range of cardiovascular diseases, such as myocardial infarction, stroke, atherosclerosis and heart failure [14, 15]. In addition, mitochondrial formation of ROS is increased particularly during cell injury, causing damage to tissue and cellular compartments [16, 17]. One of the most rapid and severe inducers of oxidative stress in the cardiovascular system is ischemia-reperfusion (IR) injury (Fig. 1), which is associated with a burst of ROS production, leading to the opening of the mitochondrial permeability transition pore (mPTP) [18, 19]. The mPTP is a high conductance non-specific channel at the inner mitochondrial membrane, and it remains closed during cardiac ischemic, but opens approximate 2 min after reperfusion . When reperfusion after a period of ischemic produces oxidative stress, mPTP opening takes place accompanied by high matrix Ca2+ concentration, elevated phosphate concentration and ATP depletion . Cyclophilin D, a prolyl isomerase located in the mitochondrial matrix, enhances the opening of mPTP through binding to the inner mitochondrial membrane under conditions of oxidative stress [22-24]. However, the regulation of mPTP-Cyp-D interaction in myocytes remains to be explored. Another pro-apoptotic Bcl2 family member, Nix, which originally modulates myocardial apoptosis , indirectly activates the mPTP and mitophagy in hypertrophied myocardium . In recent years, multiple mPTP inhibitors targeting the pore opening have been developed in the context of MI. For instance, Cyclosporin A is an effective inhibitor of cyclophilin D, treatment with which protects heart from myocardial necrosis during reperfusion, indicating a therapeutic agent for patients with ischemic heart disease [27, 28]. Schematic diagram of the proposed molecular mechanism of mPTP upon I/R in the heart. 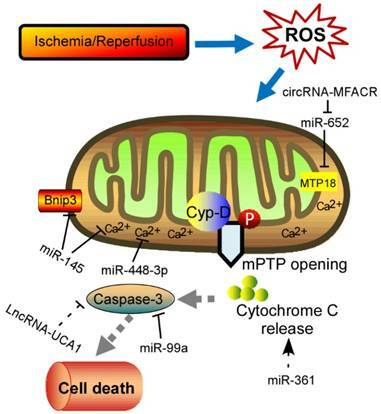 I/R‐induced cardiac injury triggers abnormal mitochondrial oxidative stress, and thereby induces mPTP opening accompanied by high matrix Ca2+ concentration and release of cytochrome C, eventually leading to cell death. The ncRNAs regulating these key components of this process are shown in the diagram. mPTP: mitochondrial permeability transition pore; Cyp-D, cyclophilin D.
There are eleven distinct mitochondrial sites associated with substrate oxidation and ETC that release electrons to oxygen to produce superoxide or hydrogen peroxide through a series of redox carriers in respiratory chain complexes [29, 30]. During ischemia, the respiratory chain becomes reduced along with the accumulation of the citric acid cycle intermediate succinate [31-33]. A large amount of studies established that the respiratory complex I is the entry point for electrons from NADH into respiretory chain, and mainly contributes to mitochondrial superoxide production upon reperfusion [34-36]. After reperfusion, the accumulated succinate is rapidly re-oxidized, driving extensive ROS generation by reverse electron transport at mitochondrial complex I . Besides, NADPH oxidases are major sources of ROS during cardiac hypertrophy. NADPH oxidase is able to produce superoxide by reducing one electron from O2, which is activated in various myocardial diseases [37-40]. There are seven NADPH oxidase isoforms that form the Nox family: Nox's 1-5 and Duox1 and Duox2 [41, 42]. These proteins share 21%-59% identity to Nox2, but differ in subcellular localization, molecular composition, and expression [43, 44]. Among them, Nox1, Nox2, Nox4 and Nox5 are expressed in specific cell types within the heart, including cardiomyocytes, cardiac fibroblasts, vascular smooth muscle cells (VSMCs), endothelial cell (ECs), and resident and infiltrating leukocytes [44, 45]. Nox2 and Nox4 are the main isoforms expressed in cardiomyocytes. Deficiency of Nox2 in vivo significantly attenuated angiotensin II (Ang II) induced cardiac hypertrophy . It is reported that Nox2-mediated ROS appears to involve the activation of Erk1/2, Akt, and NF-κB pathway [47-50]. Karim et al demonstrated that Nox2-deficient mice showed significant decline in hypoxia response, oxidative stress, fibrosis, and inflammation, indicating that Nox2 is a critical mediator of I/R injury . Recently, Nox2 was identified to be up-regulated under the prenatal exposure to maternal diabetes and enhanced myocardial I/R injury in the adult offspring through the VEGF-Akt-mTOR-Nox2 signaling . Similarly, the expression levels of Nox4 are significantly increased upon pressure overload . When generating mice with a genetic deletion of Nox4, the null mice developed exaggerated contractile dysfunction, hypertrophy and cardiac dilatation during exposure to chronic overload . Investigation of underlying mechanisms revealed that Nox4 enhanced stress-induced activation of cardiomyocyte hypoxia inducible factor 1 (Hif1) and the release of vascular endothelial growth factor, resulting in increased paracrine angiogenic activity. It is noted that Sadoshima et al found that O2- production in mitochondria were abolished in cardiac-specific Nox4-/- mice in response to pressure overload, and the null mice exhibited significantly attenuated cardiac hypertrophy, interstitial fibrosis and apoptosis, and better cardiac function compared with WT mice . This study suggested that Nox4 in cardiac myocytes can induce further ROS production, which may act as an amplifying mechanism. Another research pointed that mitochondrial ROS derived from Nox4 oxidize the cysteines of aconitase-2 and citrate synthase, leading to mitochondrial dysfunction and apoptosis in cardiomyocytes during heart failure . Anyway, further experiments need to explore the relationship between the generation of ROS and different Nox isoforms in the setting of heart diseases in the future [56, 57]. In recent years, increasing evidences have supported that ncRNAs are involved in the pathogenesis of many cardiovascular diseases demonstrated by both loss-of-function and gain-of-function approaches . Accumulation of ROS in cardiomyocytes results in differential expression of ncRNAs, subsequently contributing to cell apoptosis and heart pathology. Among these ncRNAs, miRNAs are most intensively studied, which inhibit protein translation or target mRNA degradation by bind to the untranslated regions (UTRs) of mRNA through complementary base pairing [59, 60]. Moreover, a single miRNA might have multiple molecular targets if only the target genes containing a sequence complementary to the “seed sequence” of the miRNA . Abundant of miRNAs have been identified as a powerful modulator in the process of myocardial disorders under oxidative stress (Table 1). Intracellular Ca2+ overload can relay signals through Ca2+-regulated enzymes, such as the calcium/calmodulin dependent protein kinase II (CaMKII), which has acknowledged as a ROS-activated signaling molecule that affects adverse outcomes after MI [62, 63]. Cha et al demonstrated that miR-145 decreased Ca2+ overload and apoptosis in H2O2-treated cardiomyocytes . Consistent with inhibition of CaMKII, miR-145 overexpression protects against ROS-induced cellular injury responses. Li et al also reported that miR-145 inhibited oxidative stress-associated cardiomyocyte apoptosis by regulating the mitochondrial apoptotic pathway through directly targeting Bnip3 . Excessive level of ROS would also activate nuclear factor-κB (NF-κB) pathway that is a redox-sensitive pathway . A positive feedback-loop consisting of NF-κB, miR-21, and programmed cell death 4 (PDCD4) was recently proposed . H2O2-induced NF-κB up-regulates miR-21, and PDCD4 is a direct target for miR-21, suggesting that miR-21 contributes a critical role in ROS-mediated cardiomyocytes injury. ROS have been implicated in modulating myocardin expression during cardiac hypertrophy, and myocardin is induced in response to hypertrophic signals [68, 69]. Further experiments in vitro and in vivo examined that different magnitudes and chronicities of ROS levels trigger the differential regulation of miR-1 and that, in turn, the miR-1-dependent regulation of myocardin expression contributes to the development of hypertrophy or apoptosis . As mentioned, NOX2-driven oxidative stress is involved in several cardiac dysfunctions . Kyrychenko et al found drastic downregulation of miR-448-3p in hearts of a mice model of duchenne muscular dystrophy . Downregulation of miR-448-3p leads to the increase in the expression of Ncf1 gene, which encodes the Nox2 regulatory subunit p47phox, as well as to the substantial increase in ROS production and enhanced Ca2+ signaling in dystrophic heart. Another pivotal regulator of redox response is Nrf2, a basic leucine zipper transcription factor, which is essential for the coordinately increased expression of multiple antioxidant enzymes [72, 73]. It is observed that miR-144 inhibitor abates high glucose-induced ROS formation, reduces apoptosis and improves cardiac function in streptozotocin (STZ)-induced diabetic mice by directly targeting Nrf2 . It is currently known that H2O2 works as an exogenous ROS that leads to mitochondrial fission and cytochrome c release, and the consequent apoptotic pathway [75, 76]. Therefore, lot of research was performed to investigate the relationship between miRNAs and apoptosis in response to H2O2 treatment. For instance, Li et al reported that miR-361 and prohibitin 1 (PHB1) constitute an axis that regulates mitochondrial fission and apoptosis in response to H2O2 treatment in cardiomyocytes . MiR-361 overexpression induced mitochondrial fission and myocardial infarction sizes upon myocardial ischemia injury through participating in suppression of PHB1 translation. In addition, another miR-499 is significantly increased in response to ROS stimulus and could protect cardiomyocytes from H2O2-induced apoptosis . Upon to oxidative stress, the JNK pathway was activated and then induced miR-499 which acts as an upstream mediator of the mitochondrial pathway through PDCD4 and PACS2 to block apoptosis and heart infarction. Recently, Liu et al found miR-132 expression was downregulated in blood of heart failure patients . Overexpression of miR-132 in H9C2 cells dramatically increased the anti-oxidant stress and anti-apoptotic ability, laying a theoretical guidance for clinical targeted drugs. Lipopolysaccharide (LPS) could significantly suppress viability and increase cell death and ROS level . In addition, miR-99a was reported to be capable of promoting BCL2 and suppressing the activation of caspase 3, thereby attenuating LPS-induced oxidative injury in H9c2 cells, possibly via a Notch pathway . Long et al found that miR-23a promotes cardiomyocyte apoptosis and myocardial infarction induced by I/R through directly suppressing the expression of MnSOD (Manganese superoxide dismutase), which is an important antioxidant to scavenge superoxide and protects cells from oxidative stress [80, 81]. Apart from them, many other miRNAs, such as miR-130a , miR-98 , etc, are investigated to be associated with ROS-related cardiomyocyte apoptosis. Moreover, excessive ROS is also able to cause oxidative modification of RNA, which is related to a variety of cardiac pathological events . MiR-184 was isolated to be highly oxidized in response to ROS stimulation . Such modification leads to the misrecognition of Bcl-xL and Bcl-w, which are not its native targets. Further experiments in mouse model of MI proved that the mismatch of oxidized miR-184 is responsible for the cells undergoing apoptosis. Together, these studies imply the interplay between ROS and miRNA, however, the mechanical details remain to be addressed. Besides miRNAs, lncRNAs are recently described as new regulators of redox pathway in cardiovascular diseases. LncRNAs are a set of RNAs lacking protein-coding potential, which are located throughout the whole genome . It displays multiple cellular functions, such as capturing miRNAs, guiding transcription factors (TFs), and affecting the three-dimensional structure of chromatin [86-88]. In recent years, many studies have revealed that I/R-induced oxidative stress could enhance cardiomyocyte autophagy, which is related to a variety of pathological disorders . It is well known that ATG7 is a key autophagy-promoting gene that functions in the regulation of cell death and survial [90, 91]. Consistent with these reports, miR-188-3p was defined to inhibit autophagic program and myocardial infarction through suppressing the translation of ATG7 . Anoxia/reoxygenation (A/R) have been reported to induce autophagy and a significant increase in the APF expression levels. Moreover, lncRNA-APF affected the activity of miR-188-3p and its downstream target ATG7 by sponging to miR-188-3p, and subsequently participated in regulating the signal for autophagy and cell death in the heart. Another example is that lncRNA-UCA1 is involved in I/R or H2O2-induced cell apoptosis and ROS production in the rat model . The tumor suppressor gene p27 was frequently upregulated in the ischemic heart associated with enhanced ROS production, and triggered cell apoptosis by activating cleaved-caspase 3. Follow-up experiments demonstrated that UCA1 was decreased in I/R-induced heart injury and contributed to the apoptosis of cardiomyocytes mediated by caspase3 through targeting p27. Recent study unveiled that lncRNA-ROR is highly expressed in serum of myocardial I/R injury patients, and overexpression of lncRNA-ROR could aggravate myocardial I/R damage along with increased cardiomyocyte apoptosis . In this context, lncRNA-ROR also modulates the p38/MAPK pathway, which is closely related to oxidative stress. When expressing lncRNA-ROR in H9c2 cells, the production of intracellular ROS and mitochondrial ROS was enhanced by activating the NADPH oxidase. Recent research found that lncRNA Plscr4 was upregulated in hypertrophic mice hearts, and overexpression of lncRNA-Plscr4 reserved the increased ROS production following Ang II treatment by acting as an endogenous sponge of miR-214 . Furthermore, the interaction between Plscr4 and miR-214 attenuated the inhibitory effects of miR-214 on Mfn2, which was involved in the mitochondrial fusion and fission in the hypertrophic heart . Recently, another lncRNA- TINCR is downregulated in diabetic cardiomyopathy and lncRNA-TINCR overexpression inhibited apoptosis of cardiomyocytes under high glucose treatment . Further experiments indicated that lncRNA-TINCR expression level can be used to effectively diagnose diabetic cardiomyopathy. These above studies may help in the development of new strategies for the treatment of heart diseases. However, further challenges lie in exploring the detail influence of lncRNAs in cardiomyocytes dysfunction upon oxidative stress. Another class of ncRNA, circRNAs, which form covalently closed continuous loop with its 3' and 5' ends joined together, are emerged as key regulators in multiple cellular processes by acting as competing endogenous RNAs to miRNAs [97, 98]. So far, only one circRNA (mitochondrial fission and apoptosis-related circRNA, MFACR) is illustrated during oxygen deprivation induced by MI . As is known, anoxia/ reoxygenation to cardiomyocyte causes an absolute deficit in oxygen supply and triggers the accumulation of fragmented mitochondria, which consequently leads to apoptotic cell death and cardiac dysfunction. In this study, circRNA-MFACR regulates myocardial apoptosis in the heart by directly targeting and downregulating miR-652-3p; this in turn blocks mitochondrial fission and cardiomyocyte cell death by suppressing MTP18 translation. Accordingly, circRNAs may serve as a potential therapeutic avenue for cardiovascular diseases in the future. For decades, ROS acts as signaling molecules in the pathogenesis of cardiovascular diseases related to hypoxia, cardiotoxicity and ischemia-reperfusion. Here, we describe the participation of ncRNAs in the regulation of mitochondrial-mediated cardiomyocytes death and consequent heart diseases. Taken together with their emerging role in redox signaling, the ncRNAs would offer novel and powerful approaches to restore or reverse the effects of pathological heart conditions. Due to the existence in the extracellular environment, the extracellular miRNAs are defined as circulating miRNAs who have been detected in various biological fluids including sera, plasma, urine, tears, saliva, and so on . Up to now, several circulating miRNAs have been reported to be potential biomarkers of ROS-related cardiac diseases including myocardial infarction, myocardial hypertrophy, cardiac fibroblasts and heart failure [101-103]. For instance, miR-499 is a representative biomarker in the early diagnosis of myocardial infarction and heart failure, which is detected earlier than other traditional biomarkers (such as cTnT, CK-MB) [101, 104]. It has been shown that Nox-derived ROS contributes to the redox signaling during the development of HF . Tijsen and colleagues demonstrated that miR-423-5p exhibits a strong ability to diagnose HF (area under the curve, AUC of 0.91) . Besides, many other potential biomarkers of ROS-related cardiac diseases have been demonstrated, such as miR-21, miR-378, miR-208, and miR-940 etc [102, 106]. Up to now, a mitochondrial long noncoding RNA (LIPCAR) was strongly associated with cardiovascular mortality in patients with HF, which might participate in regulating mitochondrial oxidative phosphorylation . In recent years, some antioxidant-based strategies against various cardiovascular diseases have been developed, of which, ncRNAs own new and powerful therapeutic intervention through inducing or repressing miRNA expression. NcRNA mimics or inhibitors can be easily synthesized and operate in vivo, for example, inhibiting miR-208a improved survival and cardiac function during HF progression in rat model . Intracardiac injection of mimics of miR-21 along with miR-1 and miR-24 reduced infarct size in a rat model . However, one of the major obstacles in the development of ncRNA-based therapy is the low bioavailability, which prevents small RNA molecules from delivering into circulatory system . To address this problem, several strategies have been applied, such as liposomes, exosomes, and polymers . Currently, there have been many clinical trials using RNA-based drugs [112, 113], for example, a study of Santaris Pharma's LNA-modified anti-miR-122 for the treatment of hepatitis C virus infection has completed phase 1 and phase 2 clinical trials without causing viral resistance . Together above observations, many challenges remain to be solved in clarifying the potential of ncRNAs as exciting new therapeutic tools for ROS-related cardiovascular disorders in the future. This work was supported by the Natural Science Foundation of China (Grant No: 31701733, 81470522, 31430041), Applied Basic Research Programs of Qingdao, China (Grant No: 17-1-1-46-jch), and Shandong Provincial Natural Science Foundation, China (Grant No: ZR2016CQ31).